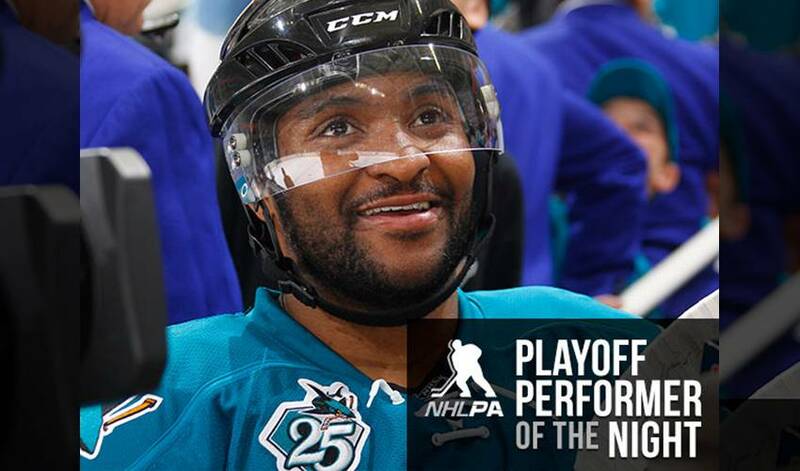 Joel Ward skates away with PPOTN honours after helping lead San Jose to a 5-2 win over St. Louis in Game 6 of the Western Final, as the Sharks now swim off to the Stanley Cup Final. The versatile veteran netted two goals in the victory, scoring one in the second period and another in the third. STAT PACK: Ward recorded two shots, was a plus-2, blocked two shots, had two takeaways, and took 24 shifts in 16:09 of ice time. ZEAL IN TEAL: Ward’s two tallies, including his fourth career game-winning goal in the postseason, enabled him to register consecutive multi-goal games for the first time in his NHL career (regular season and playoffs). Prior to Game 5 and 6 of the 2016 Western Conference Final, Ward had only recorded one other multi-goal game in his previous 69 career playoff contests (also Game 5 of 2011 CSF at VAN: 2-1-3 w/ Nashville). NICE START IN NASHVILLE: Ward scored his first NHL goal in his first game with the Predators, on October 10, 2008. GOAL RUSH: In 2014, playing for Team Canada at the World Championships, Ward began on the fourth line, but moved up and saw more ice time as the tournament progressed. In eight games, he had nine points. Six were goals. THREE CHEERS: On November 1, 2013, Ward scored his first career hat trick, as the Washington Capitals beat the Philadelphia Flyers 7-0. HAPPY BIRTHDAY: Ward shares the same birthday (December 2) as NFL quarterback Aaron Rodgers, pop singer Britney Spears, actress Lucy Liu, and former tennis star Monica Seles. HONOURABLE MENTIONS: Logan Couture had one goal and two assists for the Sharks. Patrick Marleau had two helpers and Brent Burns was a plus-4 for San Jose. Vladimir Tarasenko had both goals for the Blues. Veteran forward Joel Ward spoke with NHLPA.com and picked out five special gift ideas for five of his San Jose Sharks teammates. Jason Chimera and Joel Ward fill in for Washington Capitals reporters John Walton and Mike Vogel in a hilarious April Fool’s Day prank.